Pentathlon Ireland staged its first Laser-Run event on September 30 as part of the build-up to the 2018 UIPM Laser-Run World Championships in Dublin (IRE). 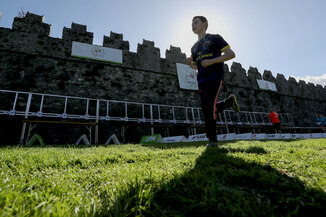 The Fingal Laser-Run at Swords Castle near Dublin was run in partnership with Fingal County Council, and there were numerous age categories of competition as well as a shooting practice station. More than 150 athletes took part on the day and Pentathlon Ireland chief executive Darragh Cunningham said: “It was a great day for Pentathlon Ireland and for all involved. Laser-Run is a fantastic tool for our sport and allows us to engage in mass participation on a scale that is far more difficult for Pentathlon as a whole. “The Family Relay was the surprise hit of the day and being bold enough to try new things like that will help us grow. There's not a lot of sporting activities out there for families so that could be a huge market to take Laser-Run into. “Pentathlon in Ireland is really pushing new ground, emerging as a commercial force with a high profile this year as evidenced by the fact that we had a regular slot on the most popular TV show in the country recently." The profile of UIPM Sports in Ireland has been given a major boost with the involvement of the Olympic pentathletes, Natalya Coyle and Arthur Lanigan-O’Keeffe, in the primetime TV show Operation Transformation. Coyle & O’Keeffe, Mixed Relay gold medallists at the 2017 World Cup Final in Vilnius (LTU), are teaching pentathlon skills to a group of celebrity beginners in the popular show, which is broadcast weekly on RTE 1. As interest in Laser-Run continues to grow in Ireland ahead of next year’s World Championships, the federation has set up its own Laser-Run website at www.laserrun.ie.